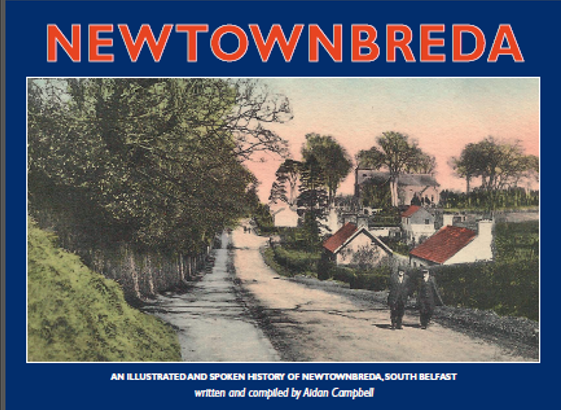 ‘Newtownbreda’ follows on from the series of local history books which covered areas of East Belfast including Beaconsfield, Knock, Cherryvalley, Gilnahirk, Castlereagh, Cregagh, Stormont, Sydenham, Belmont and East Belfast Revisited Volumes 1 and 2. 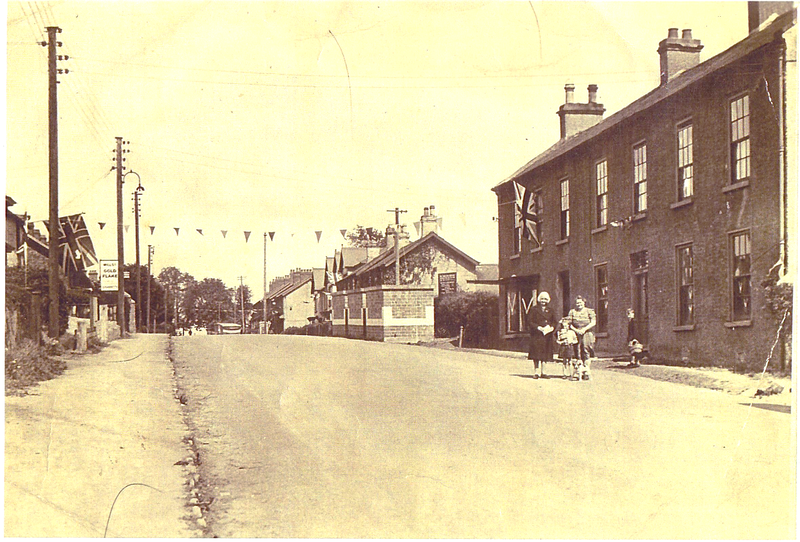 The Newtownbreda story crosses the border into South Belfast and like previous titles involves a journey along an arterial route taking in Rosetta, Belvoir, Newtownbreda Village, The Inns, Purdysburn and finishing at Carryduff. As before this book recalls the story of how and when once rural surroundings developed into the present urban environment. It brings back memories of big houses, small houses, shops, businesses, clubs, societies, pastimes, families, schools, churches, transport, everyday events and grand occasions, wartime and daily life. The story looks at the way things used to be. 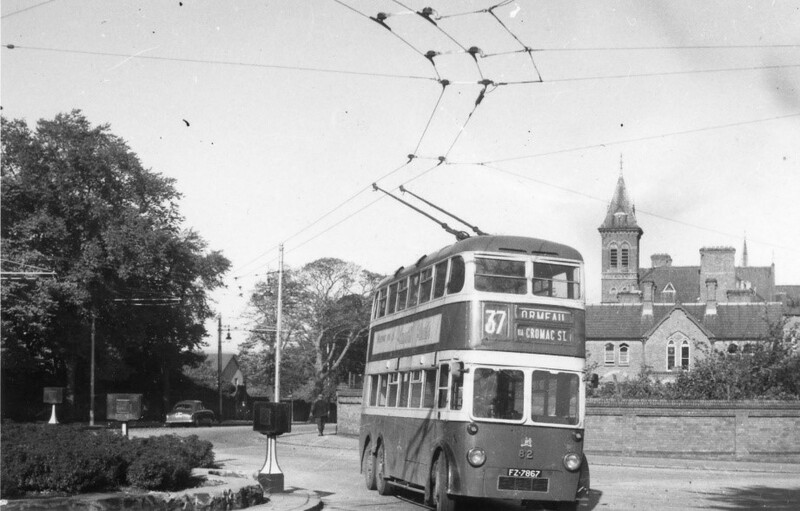 Trolleybuses replaced tramcars on the Ormeau Road route in 1948. Notice the old-style gas-lit ‘Keep Left’ signs on the roundabout. In this mid-1950s scene of Rosetta roundabout, in the background is the towering presence of ‘Nazareth House’ at 352 Ormeau Road. It was established by the Sisters of Nazareth in 1876 and originally known as ‘The Convent of the Good Shepherd.’ By 1895 the Belfast Street Directory described Nazareth House as ‘home for the aged, infirm and infantile poor’. The original buildings have been demolished and a modern development now occupies the site. During August 1843 a local newspaper reported: ‘The foundation stone of the New Presbyterian Church, Newtownbreda was laid by Sir Robert Bateson, Bart.’ The first Church service was held on 24th March 1844 by the Rev. Henry Cooke, well known now in Belfast because of his statue ‘The Black Man’ at College Square East. The first minister from 1844-1861 was Rev. Andrew Crawford. 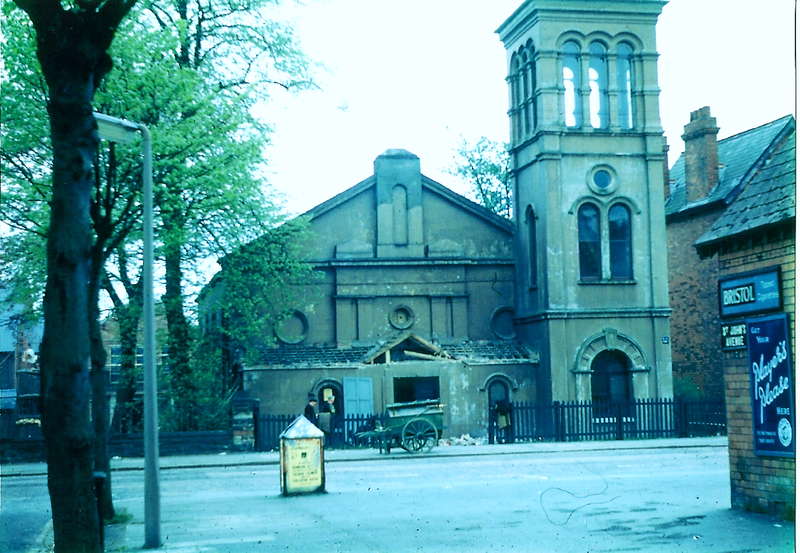 In 1967 the re-development of the Church grounds required the demolition of the Manse and the original Church building (above) which by then had become known as St John’s Hall. This was the scene in Newtownbreda Village on V.E. Day 1945, outside the Allen family home ‘Court Breda’. In the windows of their house there are small ‘V’ for Victory posters and Union Jack flags and bunting to celebrate the end of the war. There is an air raid shelter in the background. 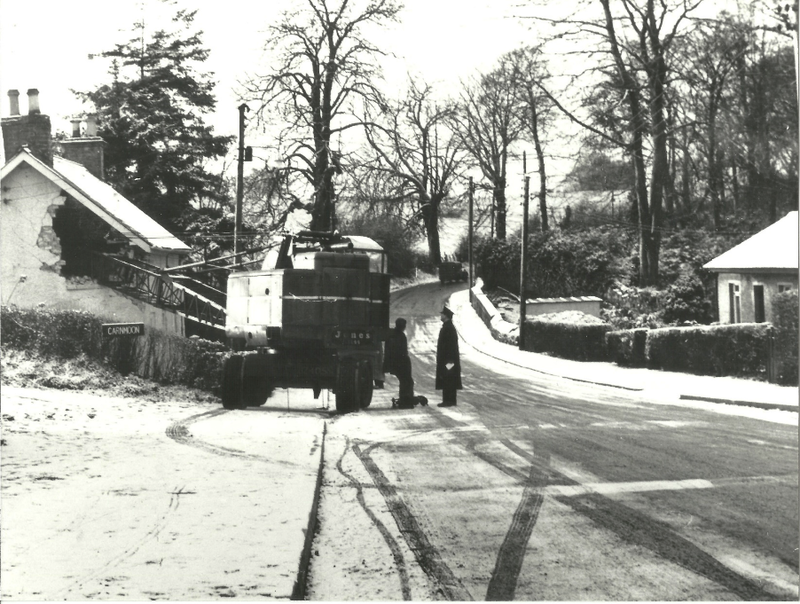 Looking along Newtownbreda Road on a snowy day in 1958 next to the site of the present Newtownbreda High School, the 50ft crane jib on the back of the lorry has done some serious damage to the gable wall of a house called ‘Verda’ when it skidded on the icy road. Verda was the home of John Martin. A single police constable seems to be interviewing the driver. In 1962 a Director of Anderson & McAuley attended a seminar on ‘Out of Town Shopping’ in Dayton, Ohio and became convinced that the future of convenience-shopping lay in the development of premises on the perimeter of cities readily accessible by car. A 10 acre site at Newtownbreda was considered appropriate, although the A55 dual carriageway did not yet exist. 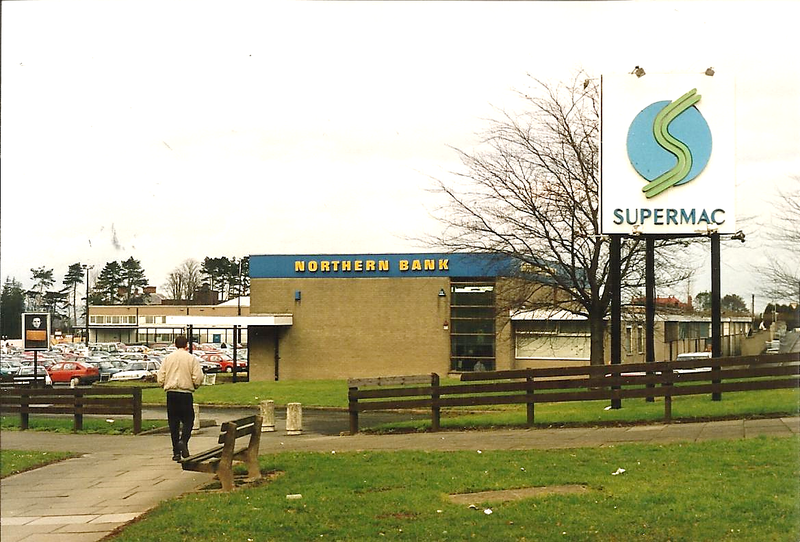 ‘Supermac’ opened in October 1964 and brought the retail revolution to the British Isles. David John Campbell was Farm Manager at Purdysburn from 1948-1970. 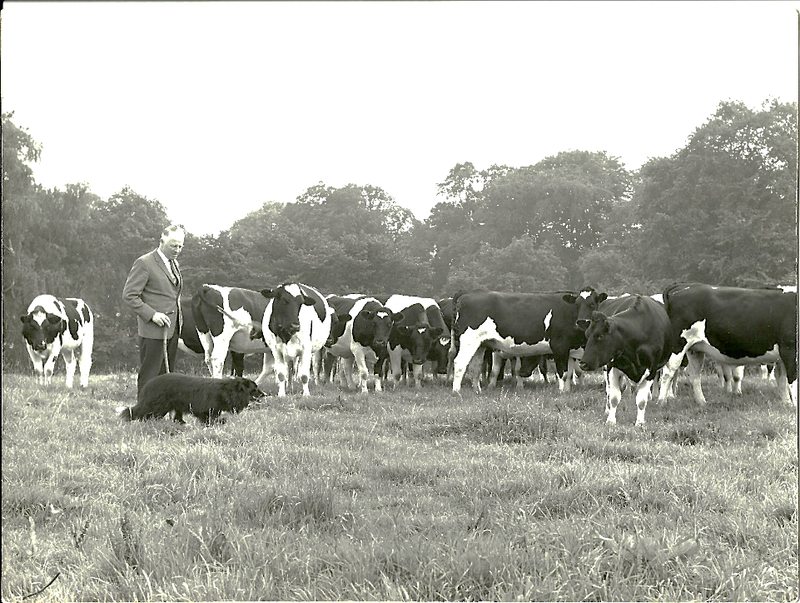 He is pictured in 1970 with his collie dog ‘Sweep’ shortly before the cattle were sold off. He reckoned that Sweep was the best working dog he ever owned and certainly lived up to his name when herding the livestock. 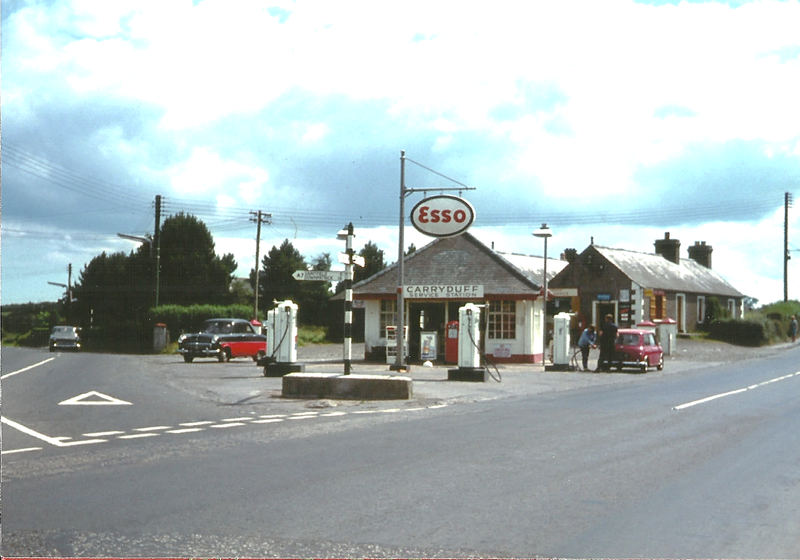 Carryduff Service Station was nearing the end of its existence in when this photograph was taken on 18th July 1966. There was a large forecourt and the RAC patrolman on his motorcycle with sidecar would park and salute passing motorists who displayed the RAC badge on their front grill. The driver of the Mini (right) is being filled up with and a fill cost about £1.00, paid for with two ‘ten bob’ notes in the days before credit cards.